Microsoft's "Patch Tuesday" set of monthly software patches is so minimal for January that at least one security firm is suggesting that IT shops first tend to recently issued patches for more severe vulnerabilities found in Oracle Java, Adobe Flash and Adobe Reader. "It makes a lot of sense to patch Java first this month, and then look at the Adobe patches," said Wolfgang Kandek, chief technology officer of IT security firm Qualys. Statistically speaking, for 2013, "Java, PDF files and Flash were the top attacked software," Kandek said. 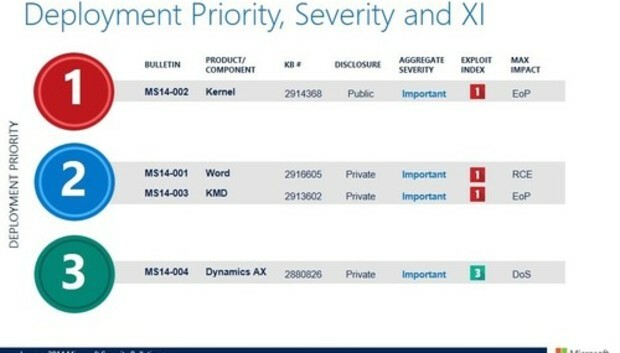 Microsoft on Tuesday issued four bulletins, covering vulnerabilities in various versions of Microsoft Windows, Microsoft Word and Dynamics AX. None were rated as critical, though Microsoft deemed all four important. Microsoft advises applying the patches in bulletin MS14-002 first. These patches fix a vulnerability that would allow an attacker to escalate system privileges in Windows XP and Windows Server 2003. In conjunction with a year-old vulnerability in Adobe Reader, this Windows kernel vulnerability has already been used in a small number of targeted attacks, according to Microsoft. Kandek advised applying the patches in bulletin MS14-001 first. Unlike the Windows vulnerability addressed in MS14-002, this vulnerability does not require the attacker to already be on the machine being compromised. It applies to all versions Microsoft Word, except the version for the Macintosh. It also affects Word document viewers. The remaining patches fixed this month address a kernel vulnerability in Windows (MS14-003), and a flaw in Dynamic AX that makes the ERP software vulnerable to a denial of service attack (MS14-004). While all these patches should be addressed as soon as possible, Kandek advised system administrators and security professionals to apply recent critical patches from Oracle and Adobe first, should they be managing these software products as well. Monday, Oracle issued patches for 144 vulnerabilities in its quarterly patch update, including 36 patches for the widely used Java SE (Standard Edition), as well as other patches for the MySQL and Oracle databases. Adobe has also issued two critical patches, APSB14-01 for Adobe Acrobat and Reader, and APSB14-02 for Adobe Flash. Russ Ernst, director of vulnerability management products at security firm Lumension, agreed with Kandek's assessment that the Oracle and Adobe patches require immediate action. "After you deploy the few needed [Microsoft] patches this month, you likely will need to turn your attention to Adobe as well as Oracle's quarterly security updates," he wrote in an email statement. Microsoft will hold a Web seminar to discuss these bulletins in more detail on Jan. 15.